Welcome to Ireland’s opening Autumn International and it’s South Africa first up at the Aviva. Watch it live here on Aertv or download the app to follow the match on the go. Well, what to make of that. The first half seemed to be controlled by a South African side that just didn’t convert their 22-time into points, but came up against an Ireland team intent on keeping their discipline in defence. Ireland came out in the second half energised and Rhys Ruddock scored an early try to put them well ahead on the scoreboard. South Africa came back into it, but Ireland’s defence was astounding throughout. A truly wonderful, intense effort from the Irish defence, capped off with a wonderful Tommy Bowe try in the right corner. That was a phenomenal performance from the 23 today, and Joe Schmidt will be extremely pleased to fashion such a comprehensive result against one of the world’s form teams. Onwards from here. 80 mins De Villiers makes some ground down the left wing. It eventually makes its way to the opposite side, and J.P Pietersen runs in a fine try. They finally broke down the Ireland defence from open play. South Africa attempt the drop goal conversion but it doesn’t make it. And that’s the final whistle! 78 mins Johnny Sexton is named the man of the match – and it’s thoroughly deserved. He has controlled the game, and kicked his goals. Meanwhile. Madigan has a penalty opportunity from the right hand side. It’s far out, but here he goes… and it’s over! That was a fabulous effort. 76 mins As South Africa come again, Ireland win a penalty at the breakdown. Another brilliant display of planned defence and intensity at the ruck. The Fields of Athenry begins to circle around the stadium. 75 mins Ireland empty the bench. South Africa come again, and are between the ten metre line and the 22 – moving back and forth from side to side. Ireland turn it over, and Madigan puts in the clearance kick. Wonderful! Sexton makes ground in the middle of the pitch, and Murray puts in a crossfield kick to the right wing, where Tommy Bowe storms on to it in his own inimitable style. Excellent play by Ireland there, and it looked like it was straight off the training ground. Sexton from the right wing… nails it! Beautiful. 72 mins Conor Murray’s box kick goes straight to Le Roux, but his attempted pass fails and Ireland will get a scrum on the South African ten metre line. Ian Madigan looks set to come on. 70 mins Ireland win a penalty as South Africa go over the top at the ruck. It’s to the right of the posts, and Sexton kicks it to extend Ireland’s lead to beyond one score. 68 mins Sexton majestically spirals a kick to within five metres of the South African line. Pushing the Springboks back further, and putting pressure on their defensive lineout. Ireland win the ball at the lineout and they are pushing for another score! 67 mins Poite stuck to his convictions on that decision – Strauss was up in the air but he also tackled Kearney when there. Ireland move into the South African half. 66 mins This is getting very messy on both sides, but the physicality is still there. Kearney goes up to take a high ball, and Poite is checking to see if he was tackled in the air. This could be a big call. It’s a yellow card for South Africa’s Strauss. Big call from Poite. 64 mins Some high intensity tackling in their own half forces South Africa to knock on as they attacked. Henshaw specifically shot forward there to dislodge the ball. 62 mins Some promising phase play from Ireland has got them a penalty in the South African half. Sexton to kick at goal from the far left hand side. There seems to be a few people in the crowd with their hearts set on making noise before a kick. Which is only slightly annoying. 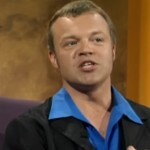 He lines it up… and he nails it! 60 mins Some back and forth kicking from both sides there, and eventually Ireland win a penalty around the halfway line. 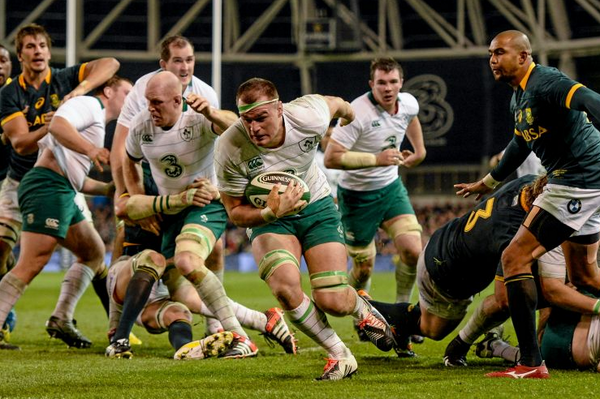 How much do Ireland have left in the tank, following a massive defensive effort? 58 mins Rob Kearney takes a high ball well, but is penalised for holding on as the South Africans are in over it as quick as a flash. They again go to the corner, and this is another chance for the Springboks in the Irish 22. There it is! Coetzee is on the back of the rampaging South African maul as they capaitalise on the lineout that they chose over the kick at goal from that penalty. It was coming. Pollard converts and we’re back to a three point game. 55 mins An attacking scrum for South Africa on Ireland’s 22, and a penalty advantage to the South Africans is awarded as they continue to attack. Poite goes back for the penalty – as Ireland were not pushing straight – and South Africa go to the corner again. 53 mins De Villiers hits the line at pace, and injects some momentum to the South African attack. They remain in the Irish 22, and are looking dangerous… again. How long can this go on? 52 mins Numerous editions of this scrum lead to Ireland ceding possession and South Africa coming again. That was a powerful shove from the Springbok pack again. 50 mins Schalk Burger knocks on attempting to burst through the strong Irish defence. So, Ireland have a scrum on their own 22, and their defence has really stood up to the South African test so far. 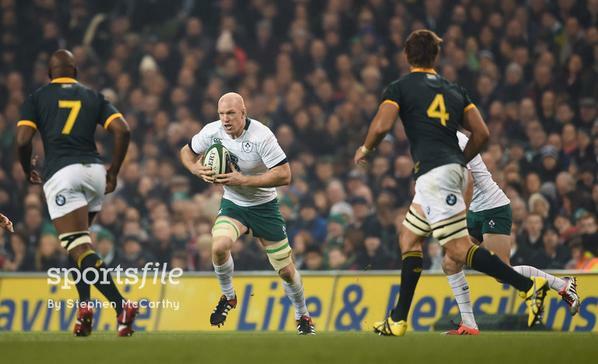 49 mins J.P Pietersen is now on for South Africa, and they come again at the Irish 22. Can they convert this pressure into points? 48 mins Ireland come forward in waves around the South Africa 22. Multiple phases and carries, but South Africa win the penalty at the ruck as Ireland lost momentum in the attack. 46 mins South Africa move menacingly into he Ireland half, but are pinged for holding on when Jack McGrath gets in over the ball. Good ruck play from the loose head prop there. Schalk Burger enters the fray from the bench for South Africa. 45 mins Another successful Garryowen puts Ireland on the front foot in the middle of the park. They work it up to the South African ten metre line, but an infringement at the ruck puts an end to the attack. 44 mins Ireland again get good possession and start to pass it wide. Peter O’Mahony kicks it ahead when a pass might have been a better option. In the following melee, Conor Murray slides in to take the ball and catches O’Mahony in the chest. He’s getting medical attention now. Rhys Ruddock bursts out of the ensuing lineout and breezes over the line. What a start for Ireland in this second half, and what a simple try for them. Sexton converts wonderfully from the left wing. Well, there we go. 41 mins And we’re back. With no changes on either side. Can Ireland stall the South African momentum for the opening period of the half? Bowe does brilliantly to catch his own Garryowen. Robbie Henshaw clips the ball right into the corner and forces South Africa to quickly find touch. Wonderful start. Half-time: Ireland started the half well for the first 15 minutes – going through phases nicely and creating some nice angles out in the backs. However, as the half went on, South Africa really started to show their dominance at the scrum and in general play. They will be disappointed that their play so far has only yielded 3 points, and given the amount of time that they spent in Ireland’s 22 that is a very poor return. All to play for Ireland in the second half. Can they get back to an even keel in the scrums though? How will their bench match up to the South African one? It will be fascinating. 40 mins South Africa clear their lines from the Sexton kick-off, and Ireland lose the ensuing lineout. A knock on by South Africa brings the half to a close. 38 mins Ireland nearly pinch it at the ruck, but O’Connell is penalised for pouncing on it while it was still in the ruck. Even though it looked like it had just squirted out the side. Pollard kicks the straightforward penalty to get South Africa on the board coming up to half-time. 35 mins Peter O’Mahony spends about 30 seconds readjusting his footwear. South Africa come again and are now near Ireland’s 22. 33 mins Ireland’s defence stands firm once again as they win a scrum off a South African lineout. How long can they hold out under this much pressure though? 31 mins Sexton tries a crossfield kick to Devin Toner, who proceeds to catch it and pass it directly to Matfield. Who then loses it backwards off an Irish hand. That could have been costly for Ireland there, but it’s only a South Africa scrum. Which could be fatal at this stage. 30 mins South Africa give away a penalty for going in over the top, as Henshaw brought it out from near his own line. Relief all round the stadium as Ireland can finally clear their lines properly. 29 mins South Africa win a penalty from the scrum! Jack McGrath singled out by Poite. South Africa go to the corner, despite the easy three points being on offer. Scrum-half Hougaard knocks it on and Ireland’s defence celebrates another scramble in defence. South Africa were confident going for that lineout, and to knock on like that is poor from the visitors. 26 mins South Africa start into their maul, and are making major ground. They didn’t use it in time though, and Ireland have a scrum 5 metres from their try line. Another close call there for Ireland, and now a massive challenge to come through this scrum. 25 mins South Africa march Ireland back at the scrum and win a penalty. That was dominant from the Springboks. 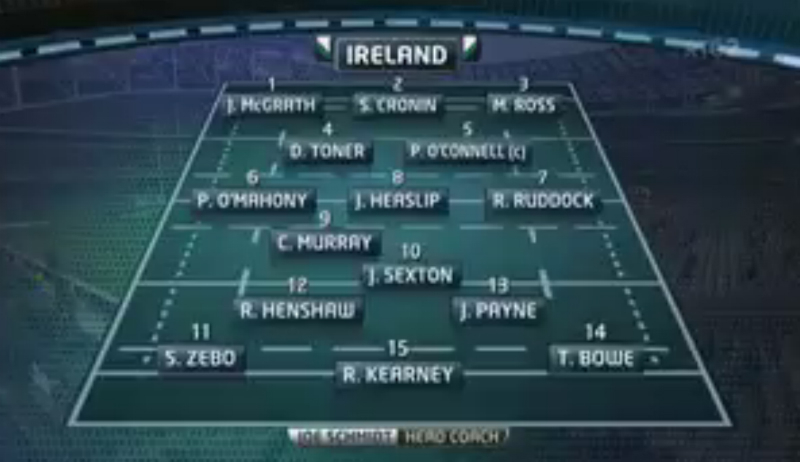 They go to the corner, and now have a lineout well inside the Ireland 22. 24 mins South Africa switch the kick off and gain a reward from an eventual Irish knock on from Robbie Henshaw. Scrum to South Africa. 23 mins Ireland’s maul does well and moves the play up to their own ten metre line. Kearney breaks the line and storms up to the SA 22. South Africa infringe at the ruck, and Ireland will have a kickable penalty. Terrific run from Rob Kearney there, as he stepped off his left and looped back inside. Sexton kicks the penalty from the left hand side, and that’s efficient attacking again from Ireland. 20 mins Le Roux breaks the Irish defensive line again, after taking a box kick well. South Africa are again on the front foot in the Ireland 22. They are now only five metres out, but give away a penalty for accidental offside just as a try was looking likely. Relief for Ireland – as South Africa’s attack was looking pacy and dangerous again. 18 mins Pollard expertly kicks in behind the Irish defensive line. He finds touch between the Irish 22 and ten metre line. Plenty of kicking from both sides so far. 16 mins O’Connell takes it forward, but the supporting ruckers go straight off their feet and give a penalty to the South Africans. Pollard lines it up… and pulls it to the left. Not a great strike from the 20 year old out-half there. 14 mins South Africa eventually win the ball on Ireland’s try line as the Irish struggle to clear their lines. Sexton manages to fly hack the ball away though, and play moves back into the SA half. Some sloppy defence from Ireland there, but they managed to scramble the defence in the end. 13 mins South Africa pinch the lineout and are now in Ireland’s 22. They spread it to the left wing but are forced into touch. Springboks applying pressure now. 12 mins Some foot tennis is exchanged between the two teams, and South Africa win the point. Le Roux finds touch near Ireland’s try line – a fantastic tactical kick. 10 mins South Africa mount their first attack of the match, and they break the line by spreading it to the left wing. They eventually come back out to the right and Le Roux passes it directly out of play. Still, they sent panic into the Ireland back line there, and there was space for South Africa to exploit. 8 mins Poite awards a penalty for Ireland at the scrum – which is a big psychological boost for Ireland. 6 mins Ireland go to the right wing from a relatively solid scrum. 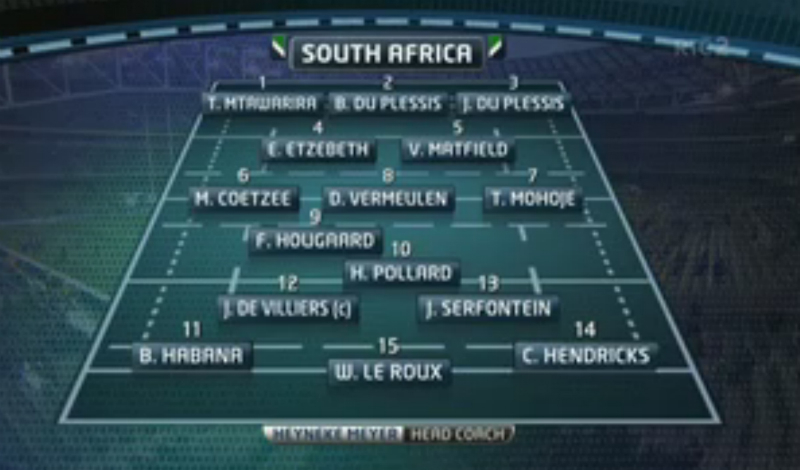 They have a lineout on the Springbok 22, and are now building the phases. South Africa infringed at the lineout, giving Ireland a free kick, and they chose to havea scrum on the 22, and it’s a good attacking position. 5 mins Coetzee makes a charge down the pitch, and fends off Jamie Heaslip – swatting him aside. Poite has gone back to check whether the flanker used his forearm in the hand off. It’s gone to the video to check for foul play. He’s decided there was nothing in it – and that’s probably the right call – so it’s a scrum to Ireland on the South African’s ten metre line. Here we go, first scrum. 4 mins Ireland work some phases in the middle of the field – with Robbie Henshaw getting his hands on the ball for the first time. Sexton goes for the corner but doesn’t make it, and South Africa clear their lines again. Good carrying from Ireland so far, and the phase play has been solid. 2 mins Garryowen from Sexton is a little too far into the 22, and Kearney tackles Le Roux in the air. Penalty to South Africa and they clear their lines. 1 min Pollard kicks off for South Africa, and Devin Toner takes it safely. South Africa knock on from the first box kick from Conor Murray. Ireland end up wit a lineout in South Africa’s half, near the 22 following a Sexton kick. 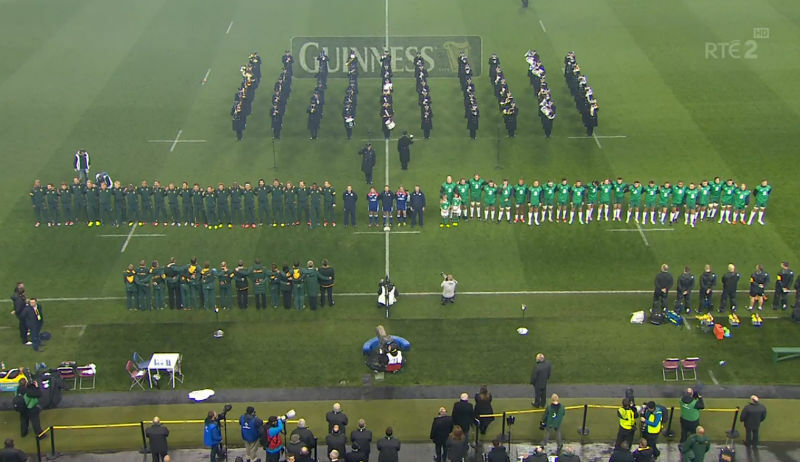 17:25 With the national anthems in full flow, we’re just five minutes from Ireland vs South Africa starting at the Aviva. 17:15 With Romain Poite refereeing this evening, the dominant scrum could be rewarded throughout – which is the French referee’s style. With Cian Healy and Rory Best out for Ireland, this could be an area that they might struggle against the powerhouse Springboks. Still, Jack McGrath and Sean Cronin will be looking to make their mark, starting on such a prestigious stage. And we have Paul O’Connell vs Victor Matfield – which is a battle we should be cherishing whilst it’s still possible.